The Baptist War, also known as the Christmas Rebellion, was an eleven-day rebellion that mobilized as many as sixty thousand of Jamaica’s three hundred thousand slaves in 1831–1832. It was considered the largest slave rebellion in the British Caribbean. The name Christmas Rebellion came from the fact that the uprising began shortly after December 25. It was also called the Baptist War because many of the rebels were Baptist in faith. Jamaica, like most British Caribbean colonies, was overwhelmingly slave and black. The enslaved outnumbered the whites on the island, by far the largest British Caribbean colony, twelve to one. They revolted in 1831 partly because of an economic depression that affected some impoverished whites and made them allies of the rebels. Tensions were high as well because the abolition of slavery was being debated in the British Parliament, and Jamaican planters, disturbed at that prospect, made inflammatory speeches and wrote articles in the newspapers, attacking emancipation. Their attitudes and actions contributed to the agitation and discontent of the slave majority. The planning and organization of the revolt came from enslaved leader Samuel “Daddy” Sharpe, who had been given limited freedom to move around the island. Sharpe used this freedom, especially the ability to travel on a traditional holiday or religious service, to discuss and plan for the actual revolt. At the end of a regular prayer meeting in mid-December 1831, Sharpe and a selected group of leaders stayed behind to discuss the plans for the revolt. Sharpe recalled examples from the Demerara Slave Revolt in 1823 in Guyana and rebellions on Caribbean islands to encourage his followers. He then had them swear on a Bible to follow the plan he outlined. On Christmas Day, the leaders of the uprising went on strike, demanding more free time and a working wage. They refused to return to work until the plantation owners met their demands. The strike escalated into a full rebellion when the planters refused their demands. On Monday, December 27, 1831, the rebellion broke out on the Kensington Estate near Montego Bay. As sugar cane fields were set on fire, whites not already in town for Christmas, fled to Montego Bay and other communities. The Christmas Rebellion included a rebel military group known as the Black Regiment led by a slave now known only as Colonel Johnson. The Black Regiment defeated a unit of local militia on December 28. 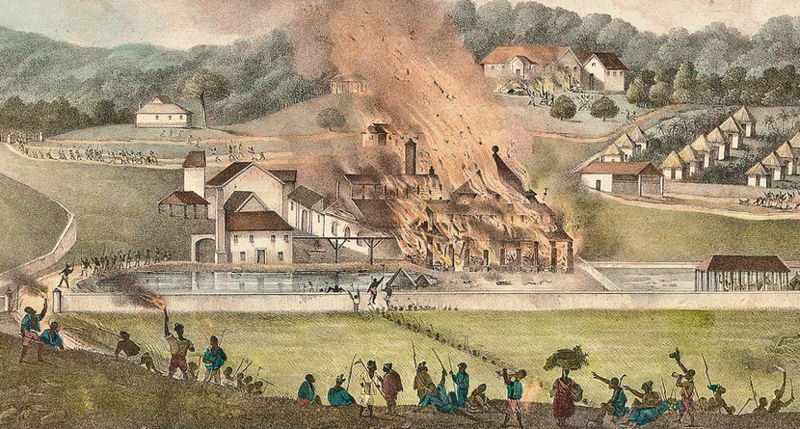 The militia retreated to Montego Bay while the regiment invaded a number of estates, urging slaves to join them while burning plantation homes and cane fields along the way. A smaller black military unit, about one hundred and fifty rebels, attacked another militia regiment at the far western end of the island. They were defeated. Approximately twenty-five rebels and one white militia man were killed in that conflict. The Christmas Rebellion ended during the first week of January 1832. However, sporadic resistance continued for another two months as the rebels resorted to guerilla tactics while fighting in Jamaica’s mountainous interior. At the end of the fighting, fourteen free blacks who supported the rebellion and over two hundred rebels had been killed. More than three hundred enslaved men and women were executed, including Samuel Sharpe, who was hanged. The Baptist War, however, pushed Great Britain to adopt full emancipation throughout all of its colonies, including Jamaica and the West Indies in 1838. “The Baptist War,” National Library of Jamaica, http://nlj.gov.jm/; Michael Craton, The Economics of Emancipation: Jamaica and Barbados, 1823–1843 (Chapel Hill: University of North Carolina Press, 1995); “The Baptist War,” Caribya Jamaica British West Indies, http://caribya.com/jamaica/history/slavery.emancipation/.